I need help for COREXY belt path. Can i make the belt at the gantry X (the two pulleys at the left and right) the same height and only the belt at the end of the rail higher or i must make the green belt higher at all path? How can i tension them? Edited 3 time(s). Last edit at 04/14/2019 05:44PM by mogey336. Belts always stay at the same height. Never offset a belt vertically. If the green one is higher, it should stay higher everywhere. 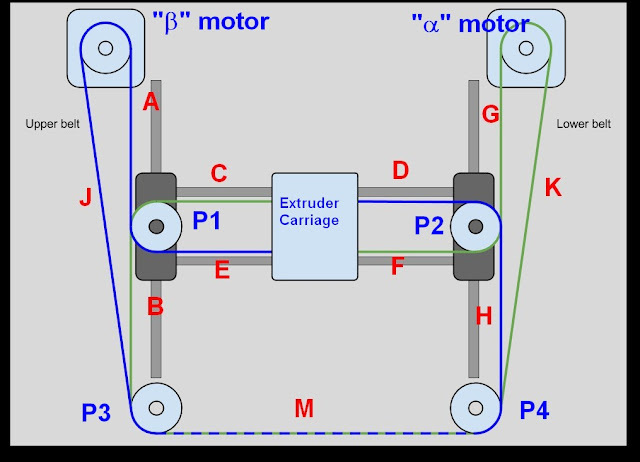 There are several places where the belts can be tensioned, but moving the motor mounts is probably the easiest to arrange. 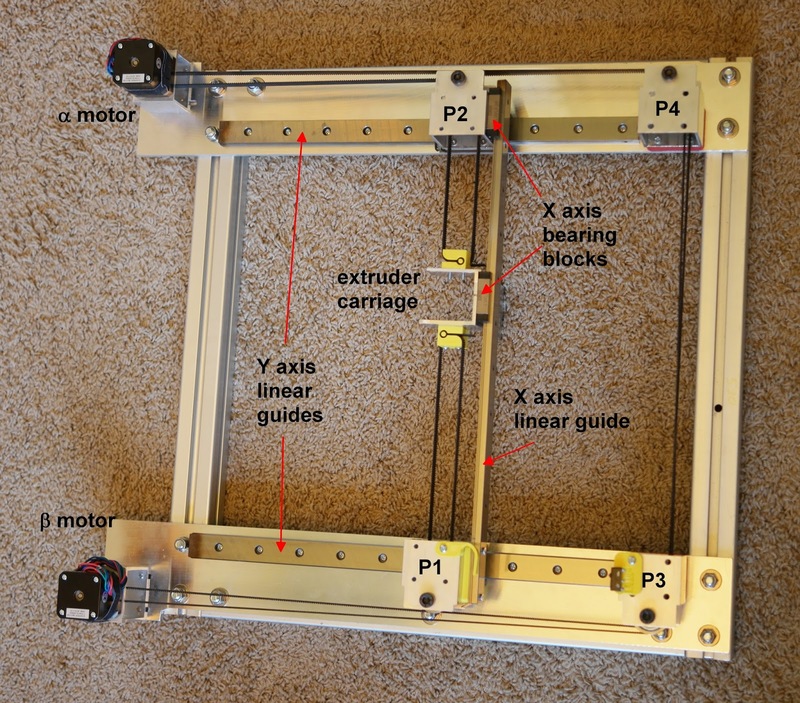 The pulleys at the ends of the X axis and in the corners don't have to be on separate axles. You can stack the pulleys. Can you explain why it must be heighter every way? It will work fine if i stack all the pulleys? The belt teeth are perpendicular to the length of the belt. They are made to operate with the belt perpendicular to the axes of the pulleys. If you try to make a belt go on two pulleys that are at different vertical levels, the belt teeth won't mate properly with the pulley teeth and the edges of the belts will be subjected to wear as they ride on the pulley's flanges. Motion will not be smooth. Yes, it will work fine if you stack the pulleys, but as always you have to be careful to position them correctly. Edited 1 time(s). Last edit at 04/14/2019 07:25PM by the_digital_dentist.